San Clemente's finest selection of Surfboard Rentals and Wetsuit Rentals available for in-store pickup or delivered directly to you in Southern Orange County! Our Surfboard Rentals range from 5’10″ to 9’4″. All boards are available for in-store pickup or can be delivered throughout Southern Orange County! USEDSURF strives to offer the best selection of Surfboard Rentals in San Clemente while providing best in-class customer service! SOME OF OUR SURFBOARD RENTALS ARE SOFT TOPS AND SOME ARE STANDARD FIBERGLASS. We offer wetsuit rentals and we have several in a VARIETY of sizes. We also rent bodyboards. With 295+ days of sunshine annually and 4.7 miles of beaches, The “Spanish Village by the Sea” San Clemente has become a strong surf town destination. Surfing is ingrained in San Clemente’s culture and lore, with history dating back to the surfing pioneer days of the 1940’s. So grab yourself a board and enjoy this beautiful piece of coastline! Call us today @ 949-506-9962 with any questions regarding our boards, our town of San Clemente or about our local surf. Multi-week rates available. Call for details. It can be an overwhelming feeling when you stand in front of 50-60 rental surfboards and need to pick a board. Luckily, here at USEDSURF, we pride ourselves on helping you choose the correct rental surfboard to make the most of your surfing experience. We base our selection on your height/weight, your experience level, the beach you plan on surfing and the day’s surf conditions. Let’s take a look at three examples and the board we would recommend in each case. Tim is 6’2” 195 pounds and plans on going to surf San Onofre (longboard point break, mellow waves) with his buddies. The surf today is 2-3 feet. Tim is gravitating towards our performance boards because he is an athletic guy and feels confident he would pick up surfing right away. Only thing is….Tim has never surfed. We spend some time with Tim and let him know that choosing one of our 9’0” soft boards would be his best choice for his size, his experience level and the beach he has chosen to surf. The 9’0” Soft Board will provide the most stability, paddling speed and glide in our surfboard rental fleet. This board is perfect for a beginner or a larger person and is the best option when the surf is smaller. Terri is 5’4” 125 pounds and plans on surfing at San Clement Pier. Today’s surf is 2-3 feet with occasionally larger waves. The surf is peaky (not closed-out), so the Pier is a good choice for Terri. Terri has surfed a number of times and can get to her feet on a board confidently. She prefers the feel of a longer board’s stability. After spending time talking with her, we recommend Terri chooses the 7’2” Torq Fish. The Torq 7’2” Fish will be a large enough surfboard to provide the glide and stability that a longer board offers. It is also a board that offers turnabilty and can be surfed in most surf conditions and breaks. This board is a great all-round board for beach breaks (like San Clemente Pier) and would be appropriate for all size surfers. Max is 7 years old and has never surfed. His family is planning on going to Doheny because the surf is big all over town (Doheny is always a much smaller wave). Max’s dad plans on pushing Max into the waves. After finding out all these details, we guide Max and his dad to a 7’0” soft board. The 7’0” Soft Board is long enough to provide stability for a smaller surfer, but it is narrower and easier to manage than a 8 or 9 foot board. This board will be easy to paddle and will work in small to medium conditions. 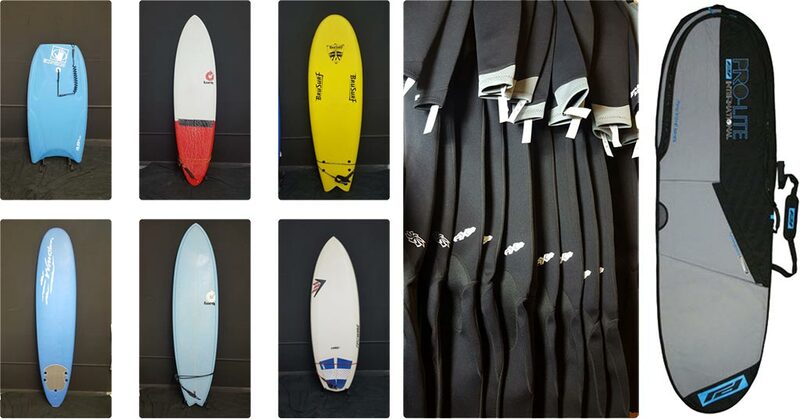 Stop by USEDSURF and browse the largest selection of Surfboard Rentals in San Clemente. We will help you choose the right board and guide you to the best beach for the day’s surf conditions.